Gourmet chocolate seller and manufacturer, Chocolats Du Calibressan, http://www.chococalibressan.com, announced today they are resuming their popular Chocolate Club, J’Adore, just in time for pre-holiday orders, with the first chocolates being shipped in October. A perfect solution for the holiday season - beginning with Halloween and moving through Thanksgiving, Christmas and New Years, Valentine’s Day and Easter; five shipments total. 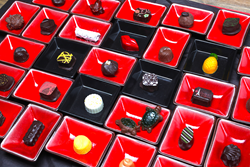 The unique J’Adore Chocolate Club ships specialty handmade chocolates to its subscribers. Each shipment includes an assortment of bonbons and truffles, in addition to a bonus chocolate gift, made especially for our club members. After the J’Adore Chocolate Club members receive their special gift, it is then available to all customers who visit one of their two Chocolate Du Calibessan locations in Southern California. Owners Jean Michel and Jill-Marie Carré were in the restaurant business for 35 years before retiring to chocolates. They sold their restaurant in France and brought their gourmet chocolates recipes with them to the United States. In 2007, they opened their popular retail store and kitchen in Carpinteria, CA, followed by their Santa Barbara location, four years later. Chocolats Du Calibressan ships everywhere in the United States. For more information about how to join J’Adore, please visit http://www.chococalibressan.com/jadore-chocolate-club.